23. Advancing sustainable solution (Conference), Organized by International Institute for Industrial Environmental Economics (IIIEE), Lund University, 26 Aug. 2015. 22. Environmental and Geological Engineering (Conference), Organized by Ministry of Education, Phosphate School, Tafila Technical University, Jordan, 21 April, 2014. 21. Jordan International Oil Shale (Symposium), Organized by Natural Resources Authority, Al-Zaytoonah University, Jordan, 14-15th, April, 2014. 20. 6th Scientific Research (Environment and Oil shale) Organized by Ministry of higher Education, Jordan, (Conference),23rd Nov., 2013. 19. Modeling of different landfill daily cover using Hydras 2D/3D in semi-arid areas, the fourteenth International Waste Management and Landfill, (Symposium), Sardinia, Italy. Sep. 29th - 3rd Oct., 2013. 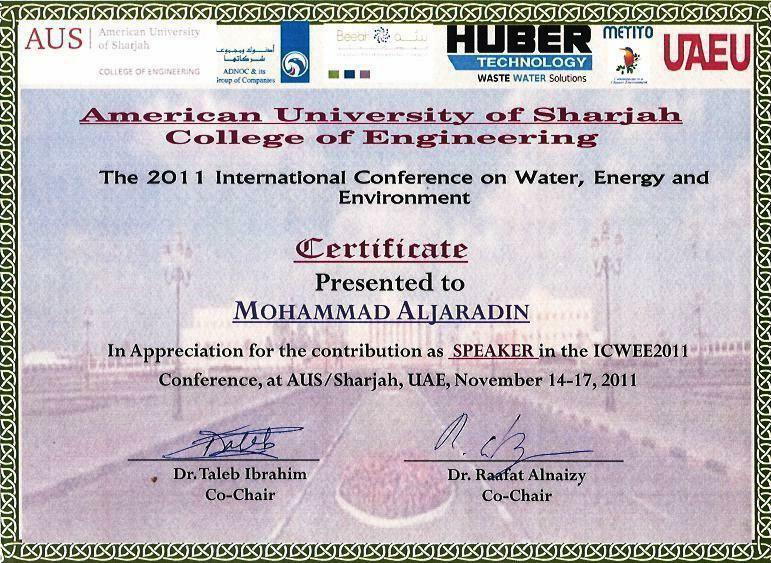 15.International Conference on Energy, Water & Environment (ICEWE 2010) (Conference), Amman, Jordan, 12-15 Dec. 2010. 14.International Conference (Handshake Across the Jordan - Water and Understanding) (Conference), Jordan, 26 - 29th September 2010,click. 13. 1st International Conference on Final Sinks, (Conference), 23-25 September 2010 Vienna, Austria, click. 12. World Congress for Middle Eastern Studies, 19-24 July 2010, Barcelona, SPAIN.click. 11. International Conference on Energy, Water & Environment (ICEWE 2010) Amman, (Conference), Jordan, 12-15 Dec. 2010. 10. International Conference (Handshake Across the Jordan - Water and Understanding) (Conference), Jordan, 26 - 29th September 2010,click. 9. 1st International Conference on Final Sinks, (Conference), Vienna Austria, 23-25 September 2010 click. 8. 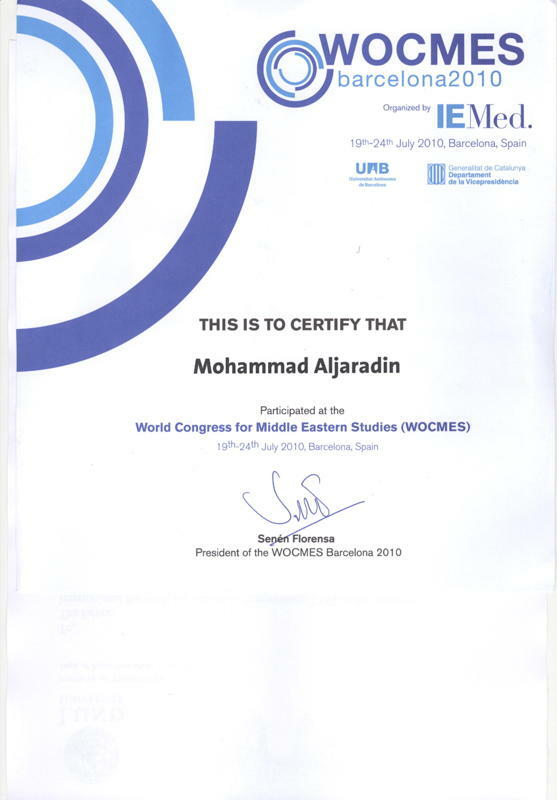 World Congress for Middle Eastern Studies, 19-24 July 2010, (Conference), Barcelona, SPAIN.click. 7. 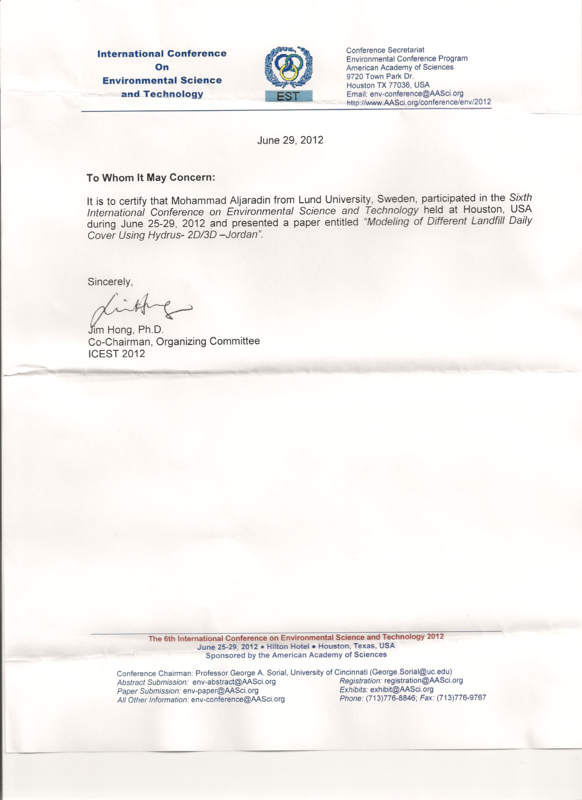 The First International Conference on Systemic Approach to Teaching and Learning, (Conference), Jordan, July 2008,click. 6. 5th Jordanian International Mining (Conference), Amman, Jordan, 2007. 5. Total Quality Management in Educational Institutions, (Conference), Tafila Technical University, 29-30July 2007. 4. Petra International Conference of Chemistry and Transmediterranean Colloquium of Heterocyclic Chemistry(Conference), Tafila Technical University, June 25-28 2007, click. 3. 4th Jordanian International Chemical Engineering, (Conference), Amman-Jordan, 2007. 2. Human Development & Security in Changing World, (Conference), Tafila Technical University, 10-12 Dec. 2007, click. 1. 4th Environmental Jordanian (Conference), Mutah University,26-27 Oct. 2007.